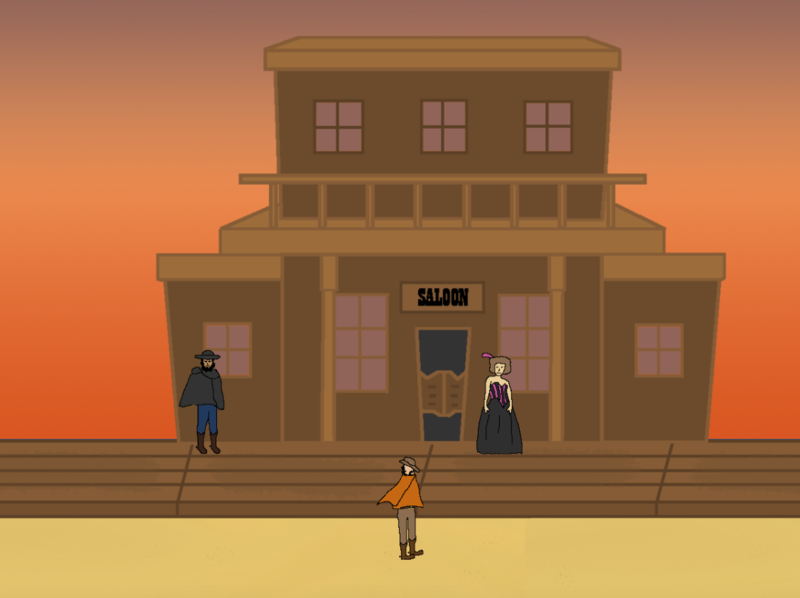 The outside of the saloon in the first level. 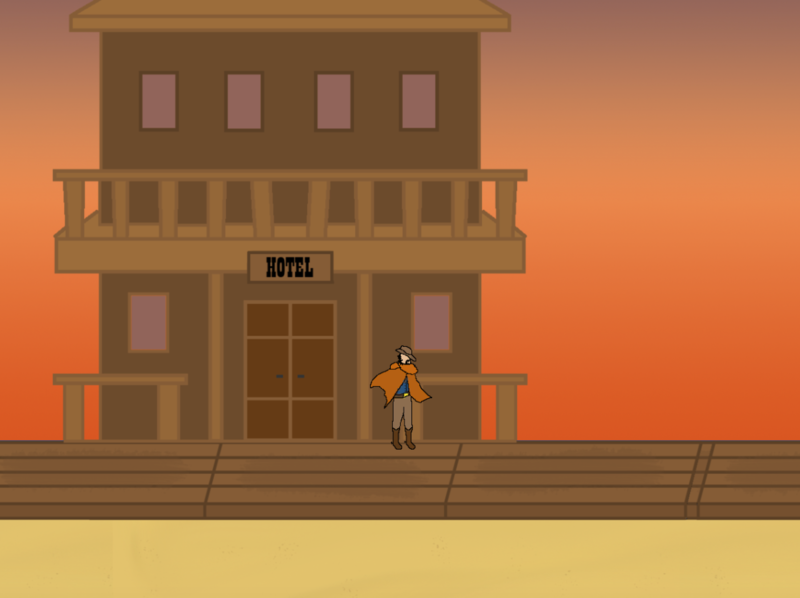 My game is about a cowboy in a movie set of an old west movie. 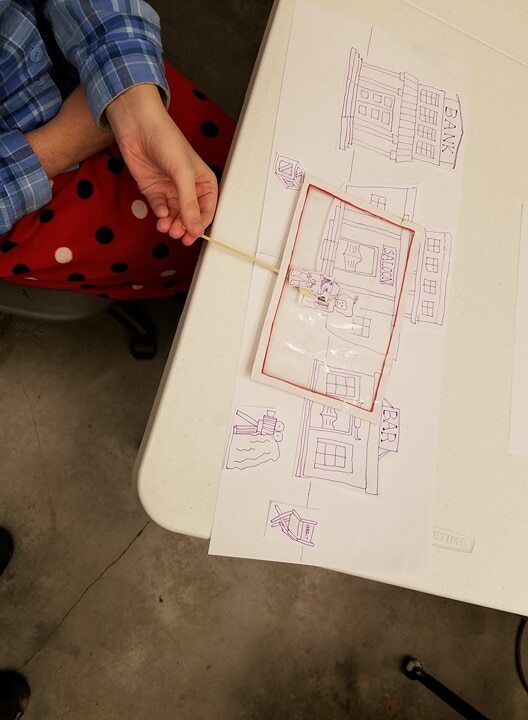 Players progress through shooting various scenes in the movie with freedom of choosing how the scenes play out. Their previous actions they take dictates the actions they can take in future scenes. For example, helping the bandit early on could mean not being able to talk to the sheriff later on. After shooting the scenes, players get to see what kind of movie they’ve made at the end. The idea came from the development process of the game. 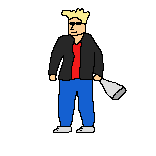 At first, I wanted to make a game about the pressure to conform to a role in front of other people. After researching the old west genre, I decided a more interesting theme to explore would be the dissonance in the escape and immersion popular entertainments promise and the stereotypes they actually show. To bring out this idea, my game puts the player in both the shoes of the producer and the audience of entertainment. After the players decide on the type of movie this is going to be about, they are forced to consume it. Through this, I call attention to the decisions made for us by the producers of the media we consume and the stereotypes they reinforce. I purposely break immersion with the movie sets to call out the lack of immersion breaking that encourages consumers to passively consume media. 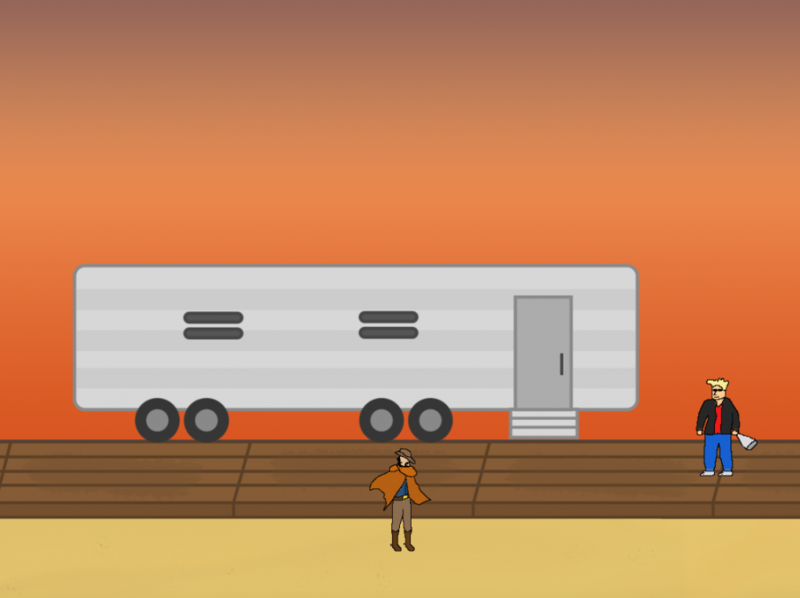 The start of the level shows the main character and the director. Note the contrasting colors. 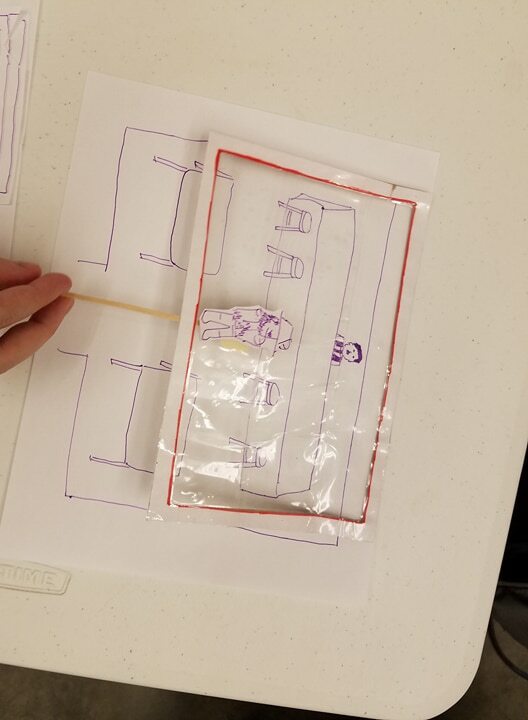 Early on in development, I made a paper prototype to test out some of the ways I could explore this idea within a game environment. My paper prototype was based on an earlier idea of the game where players had no choice but to conform to stereotypes. I learned that the traditional gamey elements like quests and dialogue options were too distracting. By stripping my game of some traditional elements, I was able to bring out the focus of my game. Testing an early iteration of my first level. The inside of a building that isn’t in the current game build. Through that process, I was able to iterate on various ideas that resulted in what I have now. Currently, I have just the first level partially built. The NPC encounters in the first level are the director, bandit, saloon girl, and sheriff. The director sets the scene of a cowboy looking for a place to stay. The rest of the NPCs each represents a “type” of cowboy the player could play. They all offer a solution for the player’s problem. By choosing the align with the bandit, saloon girl, or sheriff, players will have decided on if they want to play the bad, carefree, or good cowboy respectively. Throughout the game, players will be given the options of staying with their alignment or straying away from it. Currently, I’m working on getting my first level to run with dialogues and traversals smoothly. I’m still establishing some of the base codes of the game. Once that is done, it should be a matter of writing and building out the rest of the game. Regarding the aesthetic designs, I’m using bright colors to contrast the muted and dark color scheme of the western world. The various movie set objects in the game should stand out with their industrial and bright colors. I’m contemplating on potentially changing the colors of the game to show the player’s current alignment with the type of narrative they’re on the path to create. The color of the buildings in the town blends in with the orange sky in the background. One of the design challenges I face is to find a way to convey choice. In a traditional game, a choice is typically presented with a drop-down menu describing the various actions players could take. However, I wanted to reinforce the idea that in real life, our choice and actions aren’t always going to be laid out for us. To do this, I’ll be applying the design strategy of presenting players with options before the choice. For example, in the example of my first level, players naturally encounter with the bandit. The bandit provides the option of stealing a key from the sheriff. However, to choose that option, players will have naturally encounter their two other options before being given the ability to make the decision. Once this pattern is established, I plan to have more obscure options players can take to communicate the idea that our choices about personal identity require exploration and are not always the first option presented. While I haven’t fleshed out the full story of the game yet, I plan to keep my game fairly short in order to encourage replay attempts. I think the message becomes the clearest when players become more conscious of their actions and consequences. By having two gameplay experiences, they have a different result to compare to. Some may argue that the intended replayability makes the game’s choices less meaningful. However, I think the players’ own curiosity to explore the various options in the narrative is exactly the mindset I want them to have. The curiosity to explore the options is more important to me than living up to the consequences of the actions. Early on in the game, the impact of the players’ choices is not immediately obvious. It’s not until later in the game when restrictions are placed on the choices they can make are the results of their actions obvious. At this point, some players may feel a bit of frustration or guilt in their lack of freedom. I think this is positive for the game because it encourages people to replay the game. However, they will always end up with a coherent narrative where the cowboy is reinforcing some sort of stereotypical narrative. If the lack of control at the end takes players out of the immersion and gets them to think about how they’ve constructed their narrative, then I will have succeeded in getting my message across. I didn’t plan for the game to be so reflective of some of the things in life I’m working through right now. The process of creating this game is forcing me to look deeper at some of the influences (both positive and negative) I had growing up. I hope that this experience will not only help me grow personally but also result in a shareable product that inspires introspection for other people as well.